The trip from Kayenta, Arizona to Tuba City on U.S. Highway 160 covers about seventy-five miles. 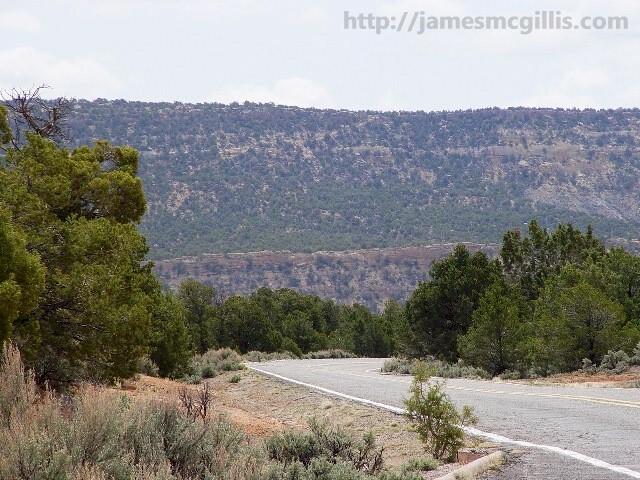 Thirty miles south of Kayenta, is the Black Mesa crossroads. From there, Arizona Highway 542 heads west toward Navajo National Monument, nine miles away. Extending east from the crossroads is Peabody Coal Company Access Road, also known as Indian Route 41. Peabody Energy is the largest private sector coal company in the world. Coal from Peabody mines accounts for almost ten percent of U.S. electrical energy production and two percent of worldwide electrical energy production. Although located wholly on tribal lands at Black Mesa, Peabody Energy has disingenuously renamed the largest strip mine in the Southwest as “The Kayenta Mine”. Peabody has a history of trying to distance itself from its own businesses. Someone in the marketing department must have decided that “Kayenta Mine” sounded better than “Black Mesa Mine”. During the past decade, Southern California Edison closed and then demolished its Mohave Generating Station (MOGS) in Laughlin, Nevada. From its inception in 1971 until its closure in 2005, Peabody Energy loaded up to six hundred tons per hour of Black Mesa Coal into a slurry pipe destined for MOGS, two hundred seventy-five miles away. If run continuously, the pipeline had a capacity of over five million tons of coal per annum. With four 8-million-gallon storage tanks onsite, dewatering the coal and recycling the vast amounts of water used in transport were high priorities. What the Black Mesa aquifer lost, MOGS gained. At the plant, MOGS recycled and reused the slurry water in their cooling loops, thus achieving zero water discharge from the plant. The Natural Resources Defense Council and the Office of Surface Mining, US Geological Survey (USGS) confirmed that Peabody Energy compromised the viability of the Black Mesa aquifer. “Since Peabody began using N-Aquifer water for its coal slurry operation; pumping an average of 4,000 acre feet, more than 1.3 billion gallons of water, each year; water levels have decreased by more than 100-feet in some wells and discharge has slackened more than fifty percent in the majority of monitored springs.” (Miller). 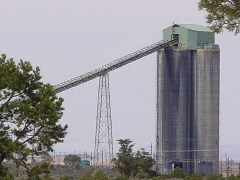 Near the intersection of U.S. Highway 160 and Arizona Highway 542, stands the architecturally imposing Black Mesa Coal Conveyor Belt and its storage silos. This is also the northern terminus loop of the Black Mesa & Lake Powell Railroad. The Navajo Generation Station (NGS) near Page, Arizona, owns the railroad and its attendant facilities. 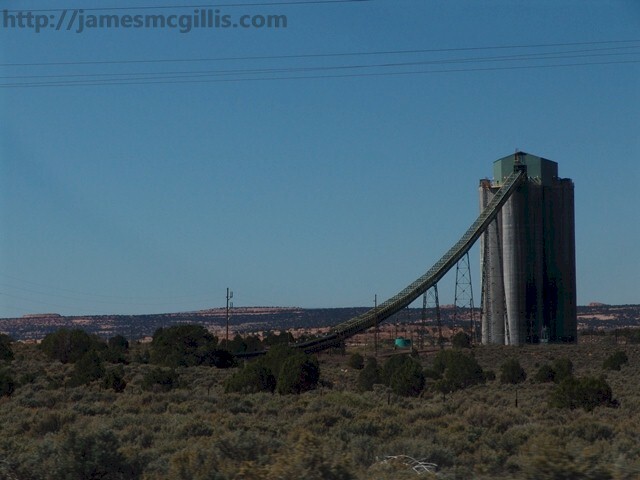 Between Kayenta and Tuba City, the loading facilities at Black Mesa Junction are the largest structures visible along the highway. From that northern terminus, dedicated coal trains travel south along the length of the both the Kletha and Red Lake Valleys. Just south of Cow Springs Lake, the tracks leave the highway, bending northwest. In a series of sinuous arcs, the tracks then snake around buttes and mesas. At NGS, there is a second terminus loop, allowing the coal trains to dump their hoppers almost without stopping. 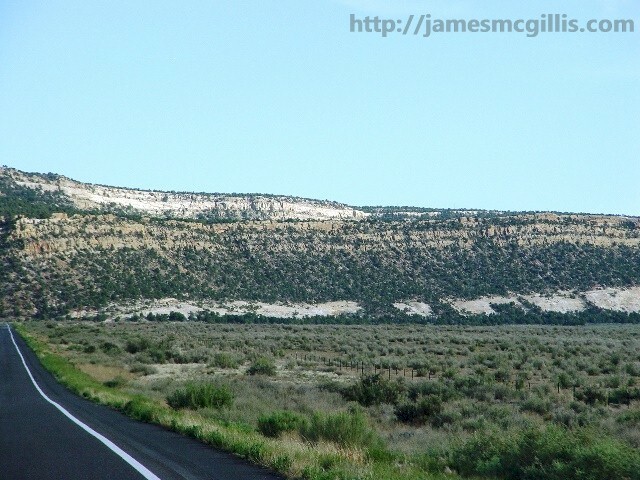 Departing the NGS loop, the one-way trip back to Black Mesa Junction is about seventy-five miles. Even in the desert, some things are too big to hide, and NGS is one of those things. 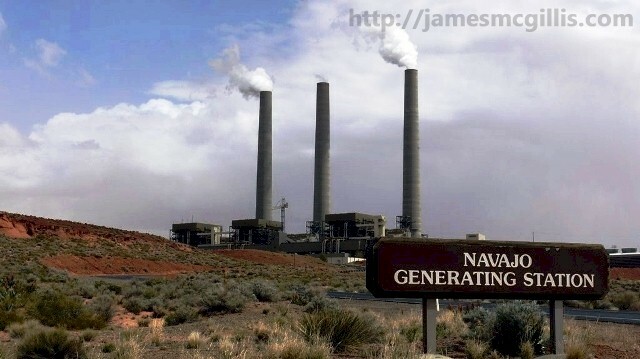 From Highway 160, the Navajo Generating Station (NGS) is invisible, hidden behind a series of low mesas. Once again, out-of-sight makes for out-of-mind. In order to visit NGS, the average tourist would have to plan a special trip on Arizona Highway 98. Not seeking to become a tourist attraction, the remoteness of NGS from commercial and tourist routes is exactly how the utility likes it. Their goal is to keep a 2,250-megawatt, coal-burning power plant mostly off the consciousness of the American public. Despite improvements over the years, contemporary coal-fired power plants are thermally and environmentally inefficient. In order to operate its plant and equipment, NGS consumes onsite fully seven percent of its own generated power. 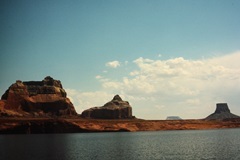 Pumping of water uphill from Lake Powell accounts for a large portion of onsite energy consumption. 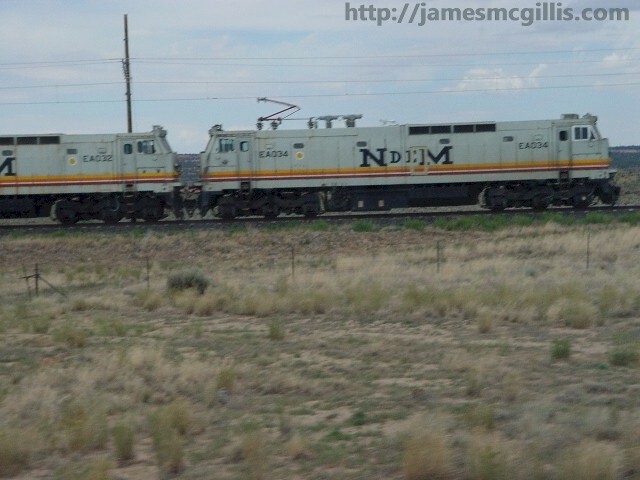 Electric train operation between Black Mesa and NGS is another net drain on transmitted power. Additional electrical power goes to run the Peabody Black Mesa Complex, including its many miles of coal conveyor belt. When all internal and infrastructure power consumption is taken in to account, NGS may well consume for more than ten percent of its gross electrical output. The generating station draws about 26,000 acre-feet (32,000,000 m3) of water per year from Lake Powell. Under average conditions, it takes about 1/2 gallon (1.9L) per kWh of electrical output. Although most of the water usage at NGS goes to scrubbing and cooling, the remainder is stored in large adjacent ponds. Only through evaporation, can the ponds cool sufficiently to allow reentry of their water into the cooling loops. In the end, it is easier to waste the water onsite than to recycle it. With that in mind, systems are set to maximize evaporation and to reduce retention on site. Once retained water reaches a high enough temperature, it loses much of its cooling capacity. To ameliorate the environmental effects of its flue gas emissions, NGS uses massive amounts of cold, Lake Powell water. From June to August 2013, Lake Powell went from 3601 ft. elevation to 3590 ft. or a drop of eleven feet. At that rate, Lake Powell will soon be much smaller and warmer. As the relict water in the depths disappears into the siphons connected to NGS, the ambient temperature of remaining lake water will rise. As the water warms, it will create inefficiency within the cooling system and scrubbers at NGS. The warmer that Lake Powell becomes, the more water NGS will have to pump in order to keep its coal fires burning at current rates. 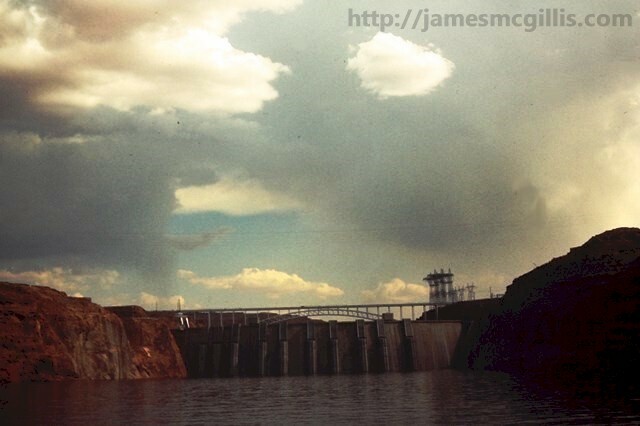 Black Mesa and the Navajo Generating Station are two of the critical links within the water and power systems in the Upper and Lower Colorado Basins. Situated in the upper Colorado Basin, NGS transmits power to pump water across the deserts of the Lower Colorado Basin. This is Chapter 1 of a four-part series regarding coal and water in the Southwest. In Chapter 2, learn the consequences of too much power chasing too little water across the landscape of the Southwest.